Congrats Baker & Brewer. We’ll see you soon! Trying a Belgian IPA @oakroadbrewery in #Summerville and waiting on @ohyahbbq to open up. Happy Friday Trail Heads! FREE JAZZ Trailheads! Check out Dockery's ticket giveaway for Thursday night's Dinner + Show event. If you haven't tried their beer yet you'll be in for a hell of a night! Go to their page and tag someone you'd take to the show with you! Shoes are the future Brut IPA from @dockerysdi is crystal clear with a stunning hop nose and an easy drinker at 7%. Beer and BBQ, by Palmetto and Rodney Scott, and it's in support of the Charleston Charter School of Math and Science. Sounds like a great night to me, Trail Heads! Enchantment under the sea IPA from @eobrewing is awesome. Also ... was that the name of the dance in Back to the Future? @westbrookbrewingco found in Aix en Provence. A taste of home on a long honeymoon. Today in Belgian drinking: the Delerium Tremens taproom, covered with historic metal beer signs and playing great (American) music. Had the Nocturnum and the Guillotine. The latter of which is an appropriately named 8.5% blonde that will take you down if you’re not careful. Tried the 12 and the 8 today. There’s a reason it comes up in the world top 10. The 8 had a little more body. The 12 was just smooth paradise. Perfection! Today’s winner. Westmalle Tripel. One of the 8 Trappist breweries in Belgium. One of the best of the style I’ve tasted. An airport @coastbrewing before heading to Belgium for a Trappist brew tour. Anyone have any beer recommendations? What are you doing for @chsbeerweek? Join Pawley’s on sept 8 for their anniversary party! 5 new brews tapped that night. Gonna be awesome! Hopzacca from @dockerysdi is a citrus hop lovers dream in a glass. Great job @jackbrewer83! Great news from Holy City Brewing and EVO! 9 days. Over 60 events including beer pairings, collaboration brews, outdoor activities, and above all, amazing brews from our Charleston breweries. Mark your calendars! Win 4 tickets to a Charleston Battery game! The rules are simple: 1. Post a photo of your fav beer 2. 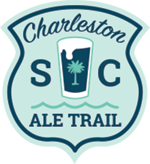 Tag and follow @chsaletrail 3. The best post received by Monday June 9 wins! Bonus if your photo includes the World Cup or the Ale Trail! It’s easy to win! Grab a copy of the Ale Trail mag from any brewery in town, take a fun photo of it, tag @chsaletrail and @chasriverdogs and BOOM! You’re up for tickets! Entries have to be in by Fri June 8 to win! Join the "Growler Club" at Tradesman Brewing Co. and you'll be able to bring your pups and sit on their patio when they open in a few weeks. What a great idea! Congrats @lachaphotography ... you win a 6-pack of tickets to @chasriverdogs! Message me to get tickets! We’ll play again next week Trail heads! Free River Dogs ticket 6-pack! Ok Trail Heads ... it’s easy: 1. Find a copy of the new Ale Trail magazine at your favorite brewery 2. Selfie with magazine 3. Tag and follow @chasriverdogs And @chsaletrail 4. We will pick our favorite pic on Friday the 25th and give out a 6-pack of tickets good for any game this season! If you’re going to drink local, you may as well do it with thousands of friends and strangers at events centered around the art of the beer. And these upcoming events in Charleston are focused on presenting amazing beers in some pretty incredible places. Want to drink Palmetto and Commonhouse with your pup at The Joe? Who doesn’t! Want to spend an entire week submerging yourself in the Charleston beer scene? Of course you do! Take a look at some of the beer-centric events coming up in the Lowcountry that make it easy to Drink Local! Welcome to the Charleston Drink Local Challenge! I know, I know … technically it’s the Eat Local Challenge. But this is Charleston, people, and we do a fair share of drinking when we go out. It’s something we’re known for, revered for even. We have an incredibly lively restaurant and brewery scene — to date Charleston supports 27 breweries, 11 distilleries, and 108,217 restaurants. For the month of April we’re focusing on moving our dollars to these locally owned purveyors of deliciousness, and if we pay attention to what we’re drinking when we dine out in Charleston — by moving our drinking dollars as well as our food dollars to locally owned and operated businesses — we’re going to increase the impact of this challenge exponentially!